Shares of Cisco Systems, Inc. (NASDAQ:CSCO) have been on an impressive rebound as of late. While Cisco stock came down with the rest of the market in both February and April, it’s been an out-performer on the way up. Over the last ten calendar days, Cisco stock is up more than 9%, compared to the 3.6% and 5.25% respective gains for the SPDR S&P 500 ETF Trust (NYSEARCA:SPY) and the PowerShares QQQ Trust, Series 1 (ETF) (NASDAQ:QQQ). With such a violent rally though, should we lighten up on Cisco? The company doesn’t report earnings until May 16th, but I could see a scenario where Cisco stock rallies into the event. Much more of a rally will put it into new 52-week high territory. There are several reasons to believe that Cisco can continue higher. The company has a ton of cash. When Cisco reported earnings back in February, it had almost $74 billion sitting in the bank. When accounting for debt, Cisco is sitting on more than $40 billion. Remember, it only has a market cap of $212 billion, so a fair amount of that value is in cash. It can return more capital to investors in the form buybacks and dividends. Keep in mind that, despite being near its highs, Cisco also yields a 3% dividend. Also note that it just bumped its buyback by $25 billion (to $31 billion) and raised its dividend by 14%. It also has the capital necessary to make one or several game-changing acquisitions. That ties into our second reason: the business transition. The “game-changing acquisitions” we mentioned above could help accelerate the software, services and security segments Cisco has been working on. Previously relying on its router and switch businesses, management knew it needed change. That’s not unlike Microsoft Corporation (NASDAQ:MSFT) or International Business Machines Corp (NYSE:IBM). Cisco needed to adapt in order to boost revenue and grow margins. Services revenue allows for both of these and generally leads to a higher valuation from shareholders. That’s also what led to an earnings and revenue beat last quarter and stronger-than-expected outlook for the upcoming quarter. While investors cheer the better-than-expected growth, it becomes all the more attractive with our third reason to buy Cisco stock: the valuation. CSCO stock trades at less than 17 times this year’s earnings and just 15 times next year’s estimates. Although estimates call for sub-3% sales growth in 2018 and 2019, earnings are forecast to grow 8% this year (only two quarters left in fiscal 2018) and almost 11% in fiscal 2019. Here’s the takeaway from the section above: Growth is accelerating. Revenue growth in 2019 will be stronger than 2018, as will earnings growth. Cisco will report its fiscal third quarter in May and that means we’re just a few months away from fiscal 2019 beginning. In this period, margins will expand as well. I think that’s why CSCO will run to new highs. It has a low valuation, hefty dividend yield and is entering a stretch where top- and bottom-line growth has a long runway for acceleration. There are not many reasons to be bearish at this point. Above is a recent chart of Cisco. One could say that each time CSCO stock has pulled back, it’s held up right where it’s needed to. At the start of the year, Cisco broke out over $38, then held that level as support during the stock market’s February freefall. That’s what I think the $45 level will eventually become. 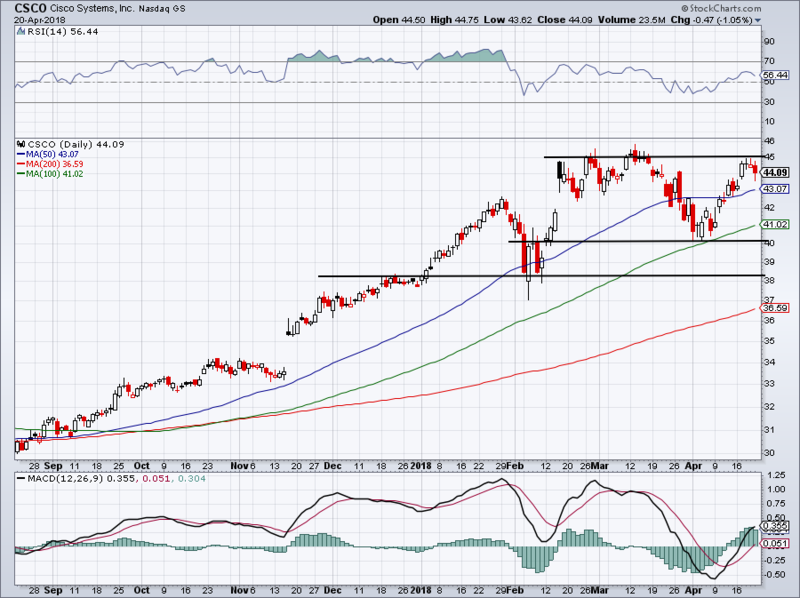 If the market behaves, CSCO stock can continue to grind higher and push through. If the market falters though, look for Cisco to retest the April lows near $40, although the 100-day moving average could act as support too. Here’s the bottom line: Cisco stock is a buy, but not right here. Either buy on a breakout over $45 or on a pullback to the $41 to $40 area. The post 3 Reasons Why Cisco Systems, Inc. Will Hit New Highs Soon appeared first on InvestorPlace.